The 9010 remote control panel connects to the Soundweb network via the usual category five cable - although direct cable termination is used in place of the RJ-45 connectors. The unit provides a graphic LCD display, six programmable soft keys, a programmable parameter wheel, and two inputs for paging microphones. It fits into a three-gang wall box. 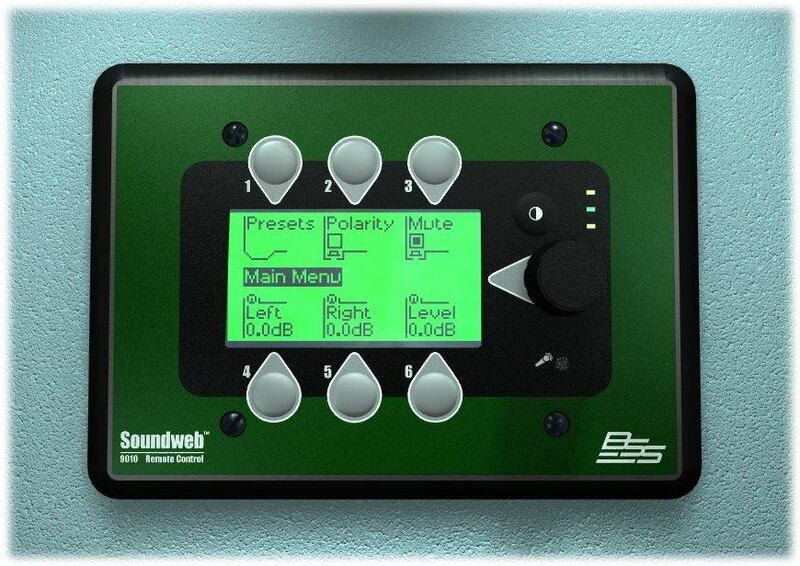 With a vast number of Soundweb systems now installed worldwide, BSS Audio has released the new 9010 Remote Controller which brings sophisticated operational possibilities to any installation but removes the need for any local technical expertise to use it. Consultants, installers and users will immediately see the operational simplicity that the 9010 can bring to a facility. 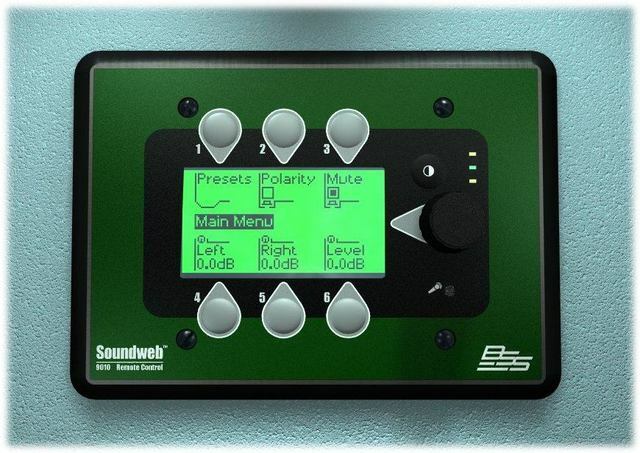 The 9010, or 'Jellyfish' as it has become affectionately known at BSS, uses 6 programmable buttons, an LCD screen and a rotary encoder to provide access to and control of virtually any function and parameter in Soundweb's DSP configurations. These include volume controls, eq settings, routing, paging, and recalling different system presets. Also included on the 9010 are an internal capsule microphone, which can be used for paging, an external microphone input, and two audio line outputs (which could be used for signal monitoring). Programming the 9010 takes place in the Soundweb Designer software, using a very simple drag-and-drop interface that requires absolutely no scripting or coding at all. Nested menus, complete with password protection if required, can be created and the whole interface can be tested in an emulation mode. The 9010 connects into Soundweb's proprietary network system which is used to route both control data and 8 channels of 48kHz digital audio around an installation.